Manage every aspect of your business like a maestro conducting their orchestra. 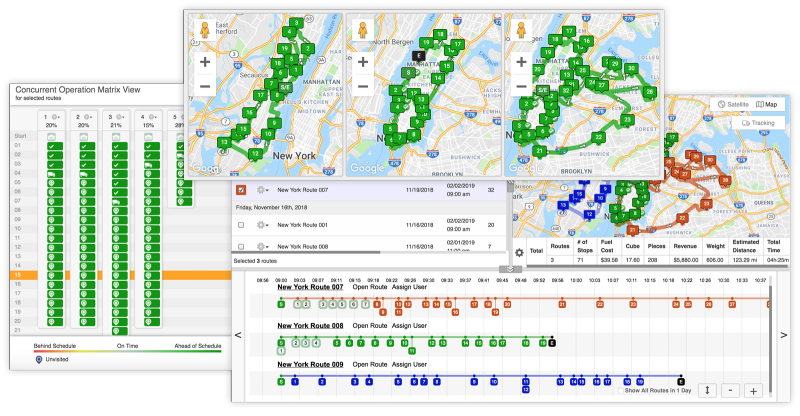 Route4Me's Operational Orchestration™ is a one-of-a-kind set of tools and automated algorithms that allows you to manage your entire company by clicking on various parts of a map. Our platform enables you to automatically notify your people (or autonomous vehicles) that are already out on the road when you decide to give them new actionable instructions. When you need to send many assets to a single central location, our system automatically finds the most optimal point of intersection on all their routes and/or lets you specify if the central location should be at the beginning or end of their currently active routes. When you need to send a supervisor vehicle or multiple vehicles to concurrently perform the same route. When you need to send a team consisting of multiple vehicles to concurrently perform the same route. When you need to replenish vehicles or assets already on the road with inventory (parts for customers, repair parts, ecommerce orders, etc.). When you want to maximize the amount of time assets spend on the road, you can send refueling vehicles to top-off vehicles that have depleted fuel (or energy) reserves as a result of unexpected events such as weather or heavy traffic.